Heddles come in a variety of sizes (dent) to allow you to control the number of ends per inch in your project. The standard heddle with each Kromski loom is 8-dent. Also available are 10 and 12-dent heddles. As you expand your weaving interests, you may want to have more than one heddle size. NOTE: It is important to consider the dent size of your heddle(s) before you choose a warp yarn. As the dent size number increases (8 to 10 to 12), the thickness of your warp material must decrease. 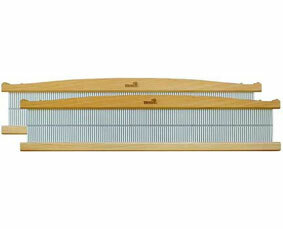 The 16" Heddle is pictured, the larger sizes do not have an arch on the top. First select the width of your loom (16", 24", or 32"), then select the number of openings per inch (8, 10, or 12 dent).